First in our Coffee Questions series, what’s the difference between coffee and espresso? With espresso flavored chocolates and desserts and coffee roasters creating blends specifically for espresso, the difference between espresso and coffee is easy to spot but can be difficult to describe. From Maxwell Colonna-Dashwood’s “The Coffee Dictionary," espresso is “an intense, highly concentrated coffee beverage of a short measure. It is brewed under pressure, which creates a layer of foam on the drink called the crema." Espresso is coffee, but coffee is not necessarily espresso. 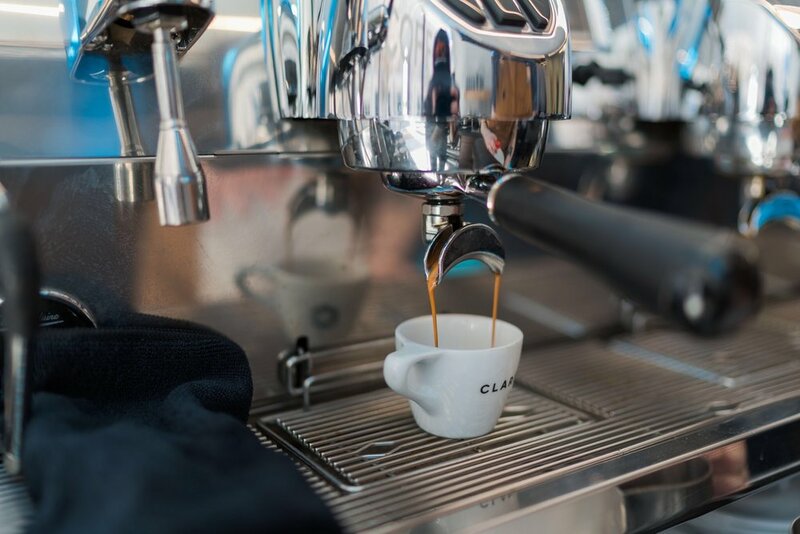 Generally put, espresso is the product of grinding any coffee far finer than you would for normal drip or filter coffee methods and using an espresso machine to extract all the warm fuzzy feelings and sweet acidity into a small one-to-two ounce beverage. We make our espresso using Victoria Arduino’s Black Eagle. For the daily “cup of coffee” drinker, drinking a shot of espresso is an intense, caffeine-filled experience. While a great Chemex pour over can have a nice light body, with a sweet, clean, finish. Espresso can be brash, with a prominent flavor of something fruity or nutty, sweet, yet acidic. If we’re using the same coffee, and espresso is really just another way to make coffee, why is there such a clear difference in flavor and strength of espresso? While a 12oz pourover is about 12 times larger than a shot of espresso, we use roughly the same amount of dry coffee to make each beverage. This concentration means more caffeine per sip and a more pronounced presentation of the different notes of the coffee. So what’s an Espresso Blend? When coffee roasters put together an espresso blend, they’re looking for balance; they’re looking for flavors that can shine through milk; they’re looking for consistency from shot to shot. Sometimes they will find a coffee with a neutral flavor profile to base the blend and then highlight it with something spectacular. Just the base might taste bland, and just the highlight might make you pucker from sourness, but together, they can taste sweet and balanced, just the way we like it. Blending coffees usually means finding coffees with similar densities, grown at similar elevations, so they have similar solubility, so they’ll extract at the same rate. Without matching solubilities, you might risk overextracting one coffee while you underextract another. Not sure what all that means? We’ll just have to cover that more in depth in a future Coffee Question! Next time you need a cup, try a shot of espresso instead! Have question you’ve wondered about but never asked? Let us know!